Back in 1996, H.O.W.D.Y. Music began as an independent music label, focused on a handful of bands in the Central NY area. Producing audio recordings and videos for bands under the label, as well as promotional materials, web sites, and design work. Upon the end of 99¢ Special in 2004, Exit, the composuer and frontman went in a different direction and began writing music which could be considered the opposite of 99. As such, the project became One Cent Left. The musical styles vary wildly - pretty much every genre is represented in some way. Zadoc began in 1993, hailing from Fulton NY, performing a slightly sinister form of rock that would soon shift towards the darker side. Although this incarnation of Zadoc has disbanded, a new line up continues on as Zadoc's Eternal Circus. Formed in Oswego, NY in 1991, 99 grew quickly to popularity with their wild and chaotic performances. Know for throwing all manner of toys and foam bricks at the audience resulting in a free-for-all battle while the show goes on. Classified perfectly by another band as "tribaltechinduslugoth" music. A solo project from 1991 by Christos DeVaris, who at the time was involved in the Syracuse based bands, industrial rock Mosiac Kisses and acid-dance trio Moses on Acid. Moses on Acid also featured Fast, who went on to fame with Fun Loving Criminals. A solo electronic experimental project featuring Exit of 99¢ Special. Dance-industrial music created by Exit of 99¢ Special. Early collaborator Matt Lundy and Exit of 99¢ Special joined forces to produce a wall of noise with 2 simple rules: 1. Nothing must be musical, 2. Nothing must repeat. This was a one time live in the studio performance which lasted for over an hour. Another side-project by Exit of 99¢ Special which housed the more melodic electronic music being created that didn't fit the 99 vibe. February 4th, 2016: In a show of epic of “better late than never”, H.O.W.D.Y. 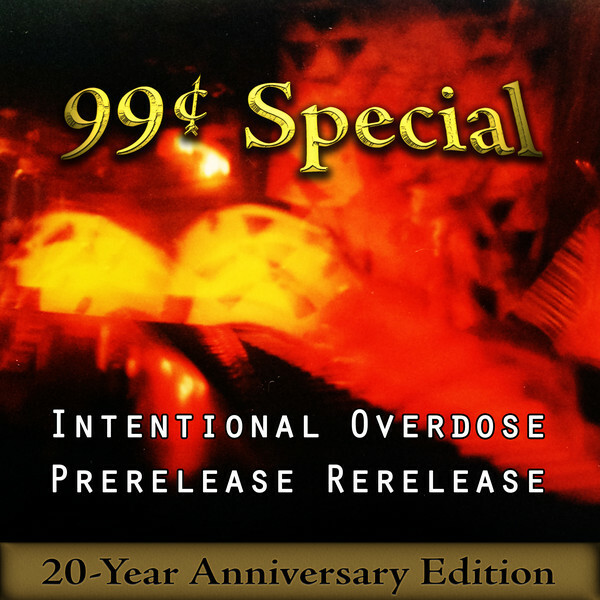 Music has released 99¢ Special’s Intentional Overdose Prerelease Rerelease [20-Year Anniversary Edition]. Originally, the prerelease went on sale in 1996 in only cassette format. Looking for global digital distribution? Get your music on Amazon, Apple Music, Google Play, Spotify, and many more using DistroKid. Sign up using the link below and get a 7% discount on creating an account.